"Berlin, 27 September 2018. As part of its 2018 initiative to cut down on the use of single-use items where feasible, or to substitute them with more sustainable alternatives, the Parliament of the United Kingdom has rolled out a new range of bio-based, certified compostable catering items, such as coffee cups, soup containers and salad boxes in the House of Commons and the House of Lords." "Bioplastics offer two paradigmatic developments at opposite ends of products’ life cycles. On the one hand, bio-based plastics enable feedstock diversification and the gradual transition away from fossil and towards renewable feedstocks. This is an essential value proposition in the EU’s bid to gain independence from fossil resource imports and to significantly reduce CO2emissions. The other key innovation proposed by the bioplastics industry is biodegradability and compostability according to existing harmonized standard on industrial composting (EN 13432), that is, the conversion of plastic materials to water, biomass, and CO2 through microbial metabolisation. Applied to food contact applications such as biowaste collection bags or food packaging, biodegradability and compostability enables the optimisation of separate bio-waste collection for organic recycling, thus preserving valuable secondary resources and establishing an important aspect of the circular economy. In other environments, biodegradability can help to reduce plastic waste accumulation, for example in modern agriculture through the use of mulch films that are biodegradable in soil according to the standard EN 17033. In addition to this, there could also be selected future applications in marine contexts where items such as fishing gear are prone to being lost at sea unintentionally." European Bioplastics has recently released a market study about bioplastics. “ Currently, bioplastics represent about one per cent of the about 300 million tonnes of plastic produced annually. But as demand is rising and with more sophisticated materials, applications, and products emerging, the market is already growing by about 20 to 100 per cent per year. 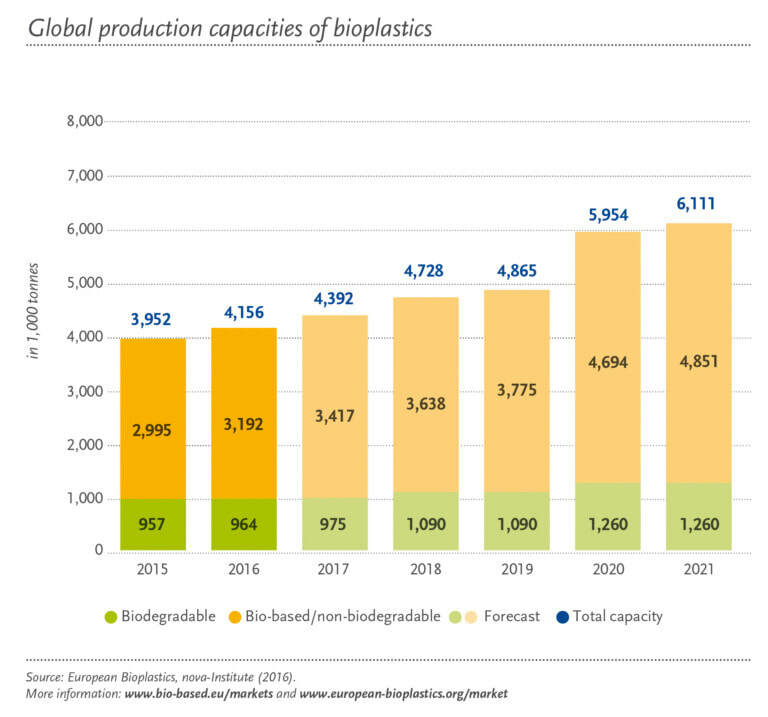 According to the latest market data compiled by European Bioplastics, global production capacity of bioplastics is predicted to grow by 50 percent in the medium term, from around 4.2 million tonnes in 2016 to approximately 6.1 million tonnes in 2021”. According to a 2016 joint study by the Nova Institute and European Bioplastics, 320 million tons of plastic are produced each year. These petroleum-based plastic objects, even if they are recycled, usually end up buried in landfills and degrade so slowly that they accumulate and are found all over the environment. In the last years, innovations in the plastics industry have mainly targeted two objectives: to make us independent from petroleum (bioplastics biosourced) and to slow down the growth of plastic waste generated (recycling). Unfortunately, these innovations can not eradicate the problem of accumulation of plastic waste or ensure the future of our upcoming generations. Recycling is a good solution, but solves only part of the problem. By recycling, we reduce the annual production of plastic needed to meet our needs. But even recycled plastics have a limited useful life and one day or another, they end up in landfills. - Bio-based bioplastics to reduce our dependence on petroleum: Bioplastics are not made from petroleum and therefore meet one of the two major challenges of the plastic industry by reducing our dependence on petroleum. On the other hand, the molecule developed is often identical to the one produced from petroleum, therefore as toxic and non-degradable as the previous one. - Biodegradable bioplastics to reduce the accumulation of plastic: To be biodegradable, a plastic must be able to decompose into various elements under the action of living organisms naturally present in the environment. Neither the time required for degradation nor the chemical properties of the final result are currently regulated. So even a plastic presented as biodegradable can take several or even hundreds of years to degrade in the environment and it can even have a toxic impact on the environment. As we speak, the sustainable solution that avoids the accumulation of plastics is composting, a process in which compostable plastics are transformed into basic elements that have become available and beneficial for the environment. But under what conditions? Make sure that these so-called compostable plastics are actually compostable, that they meet specific standards for industrial composting sites, or better, that they are compostable in your compost bin at home. This is the solution proposed by BOSK. We believe that to reduce the accumulation of plastic waste, the sustainable long-term solution is to produce compostable plastic that meets recognized compostability standards. A Quebec-based company brings a new solution to slow down the accumulation of plastics in the world. As we speak, the sustainable solution that avoids the accumulation of plastics is composting, a process in which compostable plastics are transformed into basic elements that have become available and beneficial for the environment. But under what conditions? Make sure that these so-called compostable plastics are actually compostable, that they meet specific standards for industrial composting sites, or better, that they are compostable in your compost bin at home. This is the solution proposed by BOSK. We believe that to reduce the accumulation of plastic waste, the sustainable solution is to produce compostable plastic that meets recognized compostability standards. For more than 10 years, researchers at the INRS in Québec have been developing a biotechnology to produce a 100% natural molecule : PHA (polyhydroxy alkanoate), a biopolymer that can be substituted for conventional plastic. Bosk's "bioplastic" is based on its PHA that is 100% compostable can finally meet the most stringent requirements in terms of standards for composting. At the end of life, this bioplastic can be thrown into the composting that is done at home, with the residues of gardening and cooking. No worries about its durability. PHA adds a clever blend of ingredients to meet consumer demands while ensuring its compostability at home or at industrial sites. Degradation begins only when the object is in contact with the natural bacterias living in the soil and the time required for degradation can be as low as a few weeks to a few months. Moreover, in order to preserve the most natural product possible and reduce its impact on the environment, this new generation of plastic does not originate from GMOs nor contains toxic additives such as BPA and PVC. The production of this bioplastic makes it possible to reduce the carbon footprint compared to the production of conventional plastic. And the icing on the cake: the raw material of this plastic is an untapped by-product of the pulp and paper industry. Bosk makes no compromises. Both the product and the production process are developed to reduce our impact on the environment. Bosk bioproducts does not sell PHA, but rather finished plastic products based on this PHA. Bosk is identifying the needs of the market and potential customers. The goal is to create plastic products that truly meet our needs ... and that is compostable! In short terms, Bosk Bioproducts wants to create products that contribute both to our daily well-being and to the well-being of our upcoming generations. We share articles, report and informations that might interest you if you want to learn more about the global plastic accumulation and its solutions.